…If You want to improve your private school or non for-Profit or you want support For school Formation, you'll find tremendous value in our products. Thank you for taking the time to look over the products that we have to offer. What you'll find is a group of toolkits that you will have an immediate impact on your private school or non-profit, and help you to manage and lead your organization more effectively, as well as provide detailed guidance in school formation. It contains a comprehensive Manual and Workbook and four CD's that walk you through the entire process of strategic planning. What we've done is put our +30 years of experience into one set of information that you can use to guide you through the entire strategic planning process. It's like paint-by-color, and creates an even better picture for your organization. Our Toolkit explains how to start a school from the viewpoint of those who have started their own private school and understand how to put a school together efficiently and cost effectively. The Toolkit is comrised of a series of insightful Audio Presentations and Handbooks on the fundamentals of school formation, and you can listen to their words of experience. Within minutes you can order any of these products and have it on your desk immediately in digital download and start making a huge difference to your organiziation. Are you still struggling with how to start your own K-12 Private School, College, or University? You're not alone. In fact, our clients tell us that the fundamental elements needed for school formation constantly challenge them. We've been there. And it's totally frustrating! We share with you how to start a school from the viewpoint of those who have been in the trenches and understand how to put a school together efficiently, and cost effectively. And we want the same to happen for YOU. That's why we put together this series of Webinars on the fundamentals of starting a school. We've recorded five insightful audiopresentations on both MP3 recordings and then had it transcribed and desk topped into a high quality PDF's for you to read over and grasp the critical concepts shared by experienced founders. We have priced the toolkit at ONLY US$94.97 (plus applicable taxes). Here's How To Get Your Start-A-School Toolkit" Right Now! Just click on the "Buy Now" button below and you can make your risk-free purchase by credit card or PayPal using our secure online checkout on PayPal. This Toolkit contains a comprehensive Workbook, Manual, Course, and a four-CD set containing our entire PowerPoint presentation allowing you to effectively facilitate your own planning process, our Inner Circle Presentation on strategic planning, a complete set of worksheets to walk you through the entire process, and your own limited set of eBooks on the "10 Steps To School Success." Follow our step-by-step system to developing your school's strategic plan. You'll use this toolkit so much that we recommend you clear a nice big space for it within arm's reach of your office chair. It'll fast become your favorite go-to-guide every time you're planning to plan. 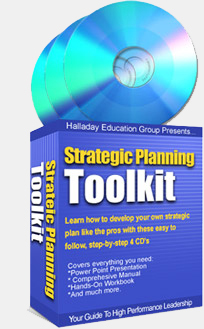 Here's How To Get Your Strategic Planning Toolkit" Right Now!